Beautytiptoday.com: Raise Your Arms, Ladies! This Dove's For You! 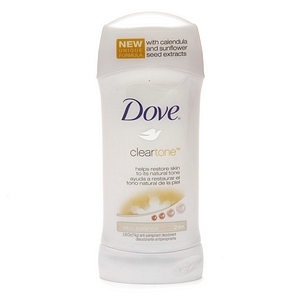 Dove Clear Tone Antiperspirant/Deodorant in Sheer Touch ($3.83, Walmart). This is a 2.6 oz. size. We are a Dove deodorant user, but we just stumbled on to this hyperpigmentation fighter, and would also like to try this one out. Dove Clear Tone claims to help "restore skin to its natural tone.". Are your underarms darker in tone than the rest of your body? If so, then it wouldn't hurt to try this deodorant/brightner. You're tackling 2 beauty issues with one product. When you shave, chances are, your skin can become inflammed. This kicks melatonin production into over-drive, thus causing the surface to darken. The skin needs lots of hydration to stop the hyperpigmentation. "Keeping skin moisturized AFTER shaving will help prevent it." She says that the "hot moist area under the arms will help "drive the ingredients deep into skin. I would recommend this to anyone.". Thumbs up on this deodorant/brightener!